“Denier” NASA Administrator Jim Bridenstine has confused critics by suggesting that humans contribute to climate change “in a major way”. 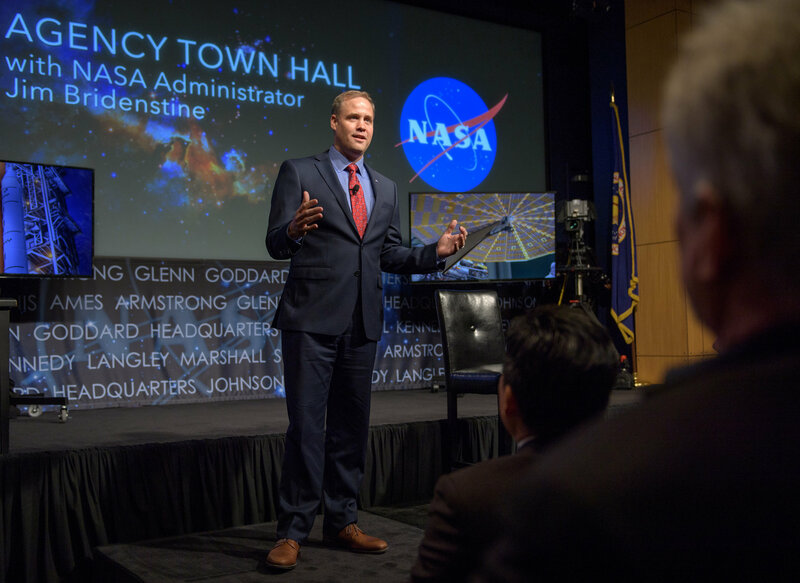 In a NASA town hall yesterday (May 17), NASA’s new administrator, Jim Bridenstine, said that he knows Earth’s climate is changing, and that humans contribute to it “in a major way,” also supporting NASA’s research into that important area. The statement is significant because Bridenstine has expressed doubt about human-caused climate change in the past, causing some to question his suitability to lead a fact-focused NASA. In 2013, as an Oklahoma congressman, Bridenstine claimed there was no current trend toward global warming. More recently, such as in his NASA administrator confirmation hearings last November, he has acknowledged that human activity contributes to climate change. But he had stopped short of saying that humans are the phenomenon’s primary cause. At the NASA employee town hall, Bridenstine described how his thinking had “evolved” on the topic and laid out his current beliefs. “I don’t deny the consensus that the climate is changing; in fact, I fully believe and know that the climate is changing,” he said. “I also know that we, human beings, are contributing to it in a major way. Carbon dioxide is a greenhouse gas. We’re putting it into the atmosphere in volumes that we haven’t seen, and that greenhouse gas is warming the planet. I think, a lot of people at WUWT think it is plausible that humans contribute to climate change in a “major way” – that low end IPCC climate sensitivity estimates are possible. But there is a big difference between thinking we contribute to global warming, and thinking we face a global climate emergency. The reason Bridenstine has surprised critics is that normally, any time someone criticises extreme climate claims, the critic is immediately caricatured as a “denier”. Alarmists stop listening to what they are saying. In the case of Bridenstine they had no choice but to listen, because he is the new boss. But what Bridenstine said didn’t conform to their prejudice of what they thought he would say. Who knows, just maybe the shock of discovering a “denier” doesn’t necessarily disagree with everything they say might prompt some alarmist climate scientists to re-evaluate their prejudices, to be more receptive to criticism and other points of view.